This cabinet card was found in an antique mall in Maumee, Ohio. Judging by the woman’s hairstyle and fashion, I date it to be from the mid to late 1880s. On the back is written Mrs. Sarah Oberdorff, and in pencil above someone added Sarah Ecrement. A quick search and I located the sitter and with further sleuthing discovered her story. When Sarah Ecrement’s soon to be husband couldn’t venture into the city and procure their marriage license without falling drunk and ending up in jail, that should have been enough to make her run the other way. But, Sarah was pregnant and this wasn’t her first pregnancy out of wedlock, so I imagine she felt pressure to go through with the marriage. Of course, it’s very possible that she was head over heels for David Oberdorff and as the old saying goes, “love is blind.” They were married July 11, 1889 and welcomed a son, John, on December 29th. John lived just 21 days. In early 1890, Sarah was again pregnant. Her husband’s drinking continued to be a problem, as it had been for years before their marriage. The local newspapers loved writing about his misfortunes. The town of Louisville, Ohio, where they lived and where David operated a carriage painting business, enacted a ban on selling him liquor. But, he simply traveled 10 miles to Canton to feed his habit. 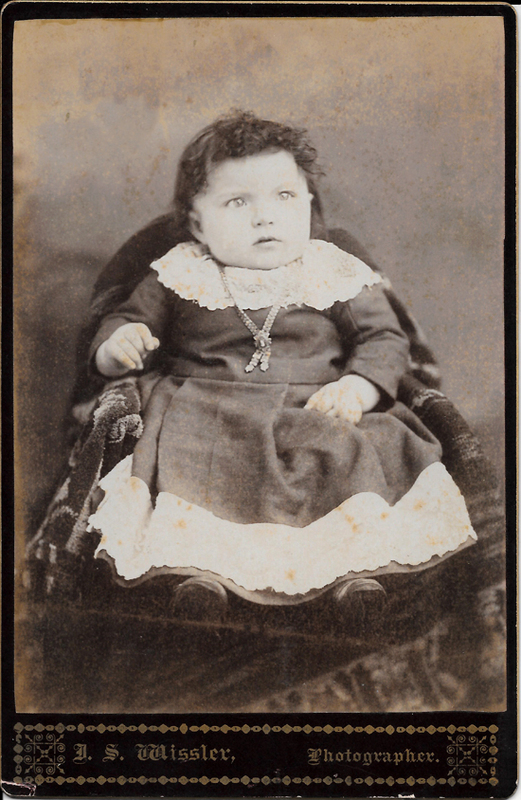 On December 4, 1890, Sarah gave birth to a son, Obadiah. David’s excessive drinking continued, and as his friends and family had feared, he “lost his reason” and was taken to the Toledo insane asylum in October, 1892, where he remained until his death on June 27, 1904, aged 58 years. With her husband committed to the asylum, Sarah was now a single parent. With all the hardships that surely entailed, I do wonder if she found it easier than life with an alcoholic. After all, Sarah was no stranger to making ends meet in a difficult economic and familial situation. She was born in 1863, into a large family of ten children. Being the second to the eldest, she very likely acted as a second mother to her younger siblings. And as was often the case with large families during the 1800s and into the early 1900s, Sarah and her older sister, Mary Alice, were sent to live with families and work as servants during their later teen years to contribute to the family financially. Although they didn’t make much, the money surely was a help. Her father, Joseph, who could not read or write, worked as a laborer and a railroad man, and her mother, Clara (nee Bair) took on the extra work involved in feeding and caring for multiple boarders (housing up to five in 1880), in addition to her own family. On Christmas day 1904, Sarah married Gardner Blackford. He also hadn’t been very lucky in love, this being his third marriage. I like to imagine that Sarah found a loving partner in Gardner and that the 23 years they shared together, before his death in 1927, brought her many happy memories. 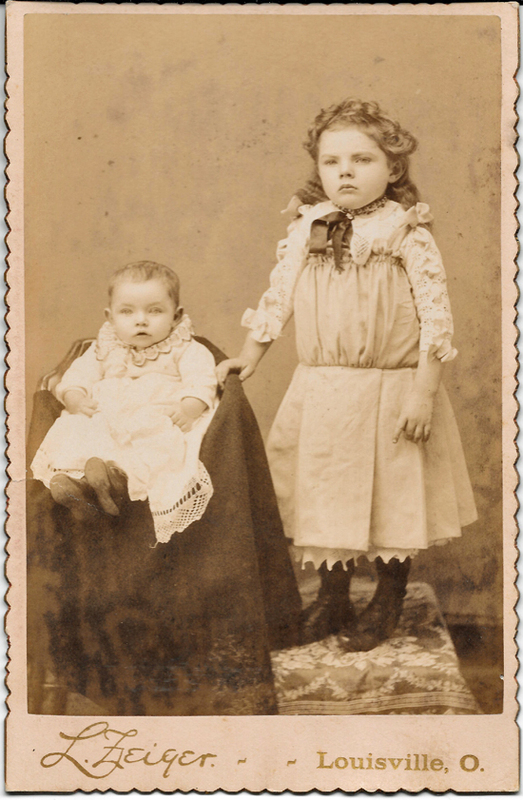 Also, purchased at this antique mall in Maumee were two cabinet cards featuring children. Upon researching Sarah, I discovered that the children were her nieces. You may click on the images to view them full size.